Hi everyone. Susan here from StylePosts. I recently did a review on a pair of plaid patterned J Brand Milla’s and was pleasantly surprised by how much I liked them. So I decided to take my patterned denim fascination a little further and try a pair of Current/Elliott’s Stiletto Plaid Jeans. I’m particularly fond of the cut on the Stiletto Jean because they’re normally more on the fitted side. However, these ones run a little on the larger side, which is not uncommon of Current/Elliott. I’d say they run almost a size large. If you’re in between sizes, go down in size. 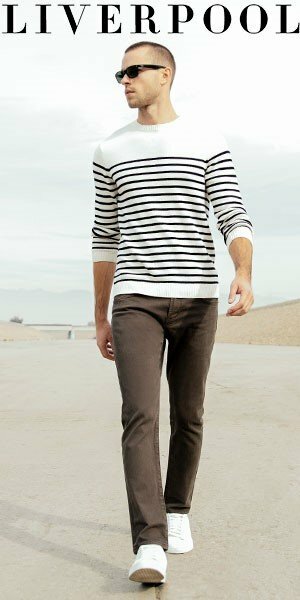 Made of 98% cotton and 2% elastin, these jeans have a lot of stretch to them. And they stretch even more with a little wear. They’re considered skinny jeans, but they’re not super skin tight. They have a slightly more relaxed fit. The color is called Sanddollar. At first glance, these jeans kind of reminded me of the mid 80s with Culture Club and Bananarama and the baggy checkered pants phase. But once I tried them on, I was hooked. These pants are definitely colorful. But the different shades are actually pretty muted, and each color has a more earthy tone. So they’re not really loud and ostentatious. And although the pattern, being plaid, is a bit on the preppy side, the cut on these jeans leaves them far from preppy in style. I like when denim brands try to change things up a little from the ordinary. That is exactly what Current/Elliott did this season with their new printed patterned jeans. This upcoming season is all about being bold. The inseam is 27 inches, which is perfect for my height. It’s an added bonus for me when I don’t need to get my jeans hemmed. The rise is 7 inches and leg opening is 10 inches. Measurements may vary slightly with different sizes. Washing instructions are: Machine wash cold, do not bleach, tumble dry low heat, iron low heat. 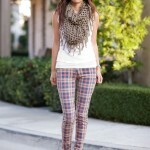 The Current/Elliott’s Stiletto Plaid Jeans reviewed here are available online from ShopBop.